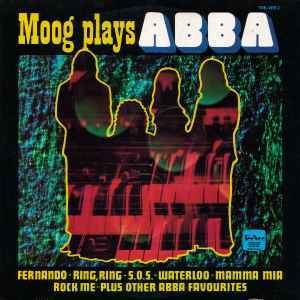 In 1976 Robin Workman arranged a 12 track LP of Abba instrumentals for release in Australia called Moog Plays Abba which was released on the Music World label. Later on that year a second LP arrived - this one on Tee-Vee - titled Moog And Guitars Play Abba. This record carries over 10 tunes from the first release (Man In The Middle and Tropical Loveland are dropped) along with 10 more - Hasta Mañana and nine covers of Arrival numbers. The band's 1973 debut album was a solid (if unremarkable) effort and its two strongest tracks Ring Ring and Nina Pretty Ballerina are included here. The latter is slowed down just a tad but the melody remains strong while Ring Ring retains the excitement of the original - all squelchy and catchy rhythms. I found the follow-up LP Waterloo a much more satisfying record and three of its tracks are featured. The title track is glammed-up moog with a wonky and endearing synth being hammered away in the background. Honey Honey works just fine with a strong piano line while Hasta Manana's comes across as sweet wedding music.. The third and self-titled album saw the start of the breakthrough. It contributes five tracks - four of them eternally known worldwide as brilliant pop singles. The arrangements are perfect with the opening one-two of Mamma Mia and S.O.S. setting an impossibly high standard of moog excellence. Elsewhere Rock Me is all about the drums and the circular melodies therein while the Spanish-flavoured Fernando (a non-album single eventually included on Greatest Hits) is nicely melancholic and one of the LP's high points. Abba's fourth album Arrival was released in October 1976. All tracks bar My Love, My Life are tackled by Workman. Dancing Queen, Money, Money, Money and Tiger are amazing - purring along like a contented cats with beefy synth stabs punctuating the divine key changes. Dum Dum Diddle and When I Kissed The Teacher are a groovy pair of kooky tunes while Knowing Me, Knowing You is played in a downbeat fashion. Finally the epic title track (itself an instrumental) is just fantastic - a stark, edge of world performance.